DriveWorks Live can run directly as an application or as a service through Internet Information Services (IIS) v7.5 or later (Requires Windows 7 or Windows Server 2008 R2 operating systems or later). IIS provides faster transmission times between IIS and compression-enabled browsers. Dynamic Compression means faster load times for your DriveWorks user forms that display dynamic content (Pictures, DriveWorks 3D Files etc.) on the clients browser. 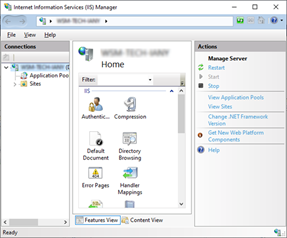 IIS runs as a service on your computer. This means that care must be taken when setting up credentials in IIS but has the benefit that you don't need to be logged on to a machine to run an application. This article explains how to set up IIS so DriveWorks Live can be accessed without having to run the application. Log on to the server machine using an account with sufficient privileges (make a note of the account used, as this will be used for the Application Pool Identity when IIS is set up). Launch DriveWorks Live and activate the license. Connect to the Group from which the projects will be specified. Ensure your Projects will run by specifying them through the Specification Explorer in DriveWorks Live. Read the following caution notes about specific items in your projects. To run DriveWorks Live through IIS your project should not use any mapped network drives. Mapped network drives are user specific, therefore it is much harder to ensure that the user you set up in IIS can access them. Fully qualified paths used by Specification Flow task locations. Images presented on user forms (although these can be relative to the project rather than full paths). Ensure the projects being specified through DriveWorks Live have any Microsoft Excel or Word documents generated by an Automatic State in the Specification Flow. This will allow these documents to be created by DriveWorks Autopilot and not DriveWorks Live (which it will not be able to do when running as a service through IIS). To maximize performance and for the best user experience, we recommend that as much processing as possible happens when in an Automatic state (Since the processing will be performed by DriveWorks Autopilot). All DriveWorks plugins used must be installed locally on the machine hosting IIS. Network located plugins will not run through IIS. By default, the Web Server role (IIS) is not installed on Windows Server 2008 R2 and Windows 7. Additionally, some of the IIS Manager features and IIS 7 functionality are not available on all editions of Windows 7. Please refer to the external links below for procedures to install IIS 7. Installing IIS 7.5 on Windows Server 2008 R2. Installing IIS 7.5 on Windows 7 Professional, Enterprise, or Ultimate. Installing IIS 7.5 on Windows 7 Home Premium, Home Basic, or Home Starter. Follow the steps below to add your site to the IIS Manager. This can be found by launching the Control Panel (from the Windows Start Button), selecting System and Security, then select Administrative Tools and then double clicking Internet Information Services (IIS) Manager. From the connections pane expand the computer name link and select the Sites node. Right click on the Sites link and select Add Web Site. On the Add Web Site dialog enter a Site Name - This name identifies the site in the IIS Manager only, it does not appear externally, although it is good practice to use the same name as your site (for instance www.driveworkslive.com). Click the button at the end of the Physical Path field. Browse to the location of the DriveWorks Live theme that contains the web.config file required to be used with this site. Port 80 is the default port for HTTP traffic. If port 80 is in use by another web service on your web server you may need to change this to the next available port. For more on assigning bindings to sites please see the TechNet article Add a Binding to a Site (external link). From the IIS Manager select Application Pools from the Connections panel. From the Application Pools list locate the site that was added above and click the Advanced Settings link in the Actions panel. This will launch the Edit Application Pool dialog. From the .NET Framework version drop down select .NET Framework v4.0. True - if running a 32bit machine. False - if running a 64bit machine. Check the Identity the service is to run under is correct. This should be the login credentials DriveWorks Live was installed and run under on the machine IIS is being set up on. If the Identity is correct, click OK and proceed to Step 9. From the Identity field launch the Application Pool identity by clicking the button at the end of the field. Proceed to Step 8. From the Application Pool Identity dialogue select the Custom account type and click the Set.. button. Enter the User name, Password and Confirm Password. Click OK in the Advanced Settings dialogue to apply the changes. Select the site from the Connections panel. Click the browse link in the Actions Panel. This will launch your default web browser with the landing page of DriveWorks Live loaded. You will not be able to login until you have set up your group connection string (see below). If your browser reports an error message, please see How To: Troubleshoot IIS. DriveWorks Live needs to know which Group to use (Including which server the group is on). 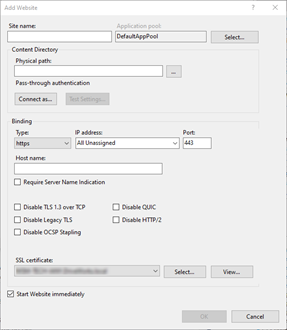 When using IIS this is done using a connection string in the .config file. The Group Connection String holds two pieces of information critical to ensuring DriveWorks Live runs with Internet Information Services (IIS). Server - is the location or name of the computer running DriveWorks Pro Server. Name - is the name of the Shared Group that exists on the computer running DriveWorks Pro Server and is required to be connected to through IIS. Open the .config file using notepad or a similar text editor. Where MachineName is the name of the machine hosting DriveWorks Pro Server. And GroupName is the name of the Shared Group to connect to. ProServerMachine DriveWorks Pro Server is located on a machine named ProServerMachine. DriveWorks Pro Server is located on the local machine i.e. the same machine running IIS (not ideal scenario). ProductionGroup The name of the Shared Group hosted on the DriveWorks Pro Server machine to connect to. The name of the Shared Group hosted on the DriveWorks Pro Server machine to connect to. DriveWorks Autopilot can generate models based on user requests from a browser in DriveWorks Live. If you are using DriveWorks Autopilot in this way, you will need to tell DriveWorks Live which machine you are using. Web Themes can be customized, and the customization files can be moved from their default location. In this case DriveWorks Live needs to know where the customized files are. The pathToConfiguration string holds information that tells IIS where the Theme customizations are located, when they have been moved from the default location (as specified in the note box above). Using Windows Explorer locate the config file for the Web Theme and make a copy for back up purposes. The full path of the new location should be noted. If you have followed step 3 above you will see the groupConnectionString has been inserted. Where NewLocation is the full path to the location of the customized Theme files. When running an implementation through IIS the value applied to the File Size Limit for the Upload Control will not be honored. This value should be applied directly in the web.config file. Using Windows Explorer locate the web.config file for the Theme you are using and make a copy for back up purposes. Open the web.config file using notepad or a similar text editor. Change <default value> to the required value (in bytes). For example 20 megabytes would be 20971520. A further setting: maxAllowedContentLength, should be applied to the web.config file. However the location of this setting differs between the Web Theme and Application Theme. Where Value is the same value used for the maxRequestLength in step 4 above. If you're using a load balancer with Application Request Routing then you will need to copy the modified web.config file to this server. One of the limitations to HTTP is that it was designed as a one-directional method of communication. However, many modern web-based applications (DriveWorks Live) require more real-time, two-way communications in order to function optimally. DriveWorks Live, when run through IIS, utilizes WebSocket Protocol to implement two-way communications over the Internet between a client and server. To enable Web Sockets please refer to the article IIS 8.0 WebSocket Protocol Support. Web Theme - designed to provide a true web experience with the flexibility of further customization. Application Theme - designed to provide most of the functionality of DriveWorks User with a similar look and feel, cannot be customized. To customize the web theme please see the topic Web Theme.